We are proud to announce that our first body-off restoration is completed. This “Backcountry” spec' is a no-holds-barred Defender for overland adventure. 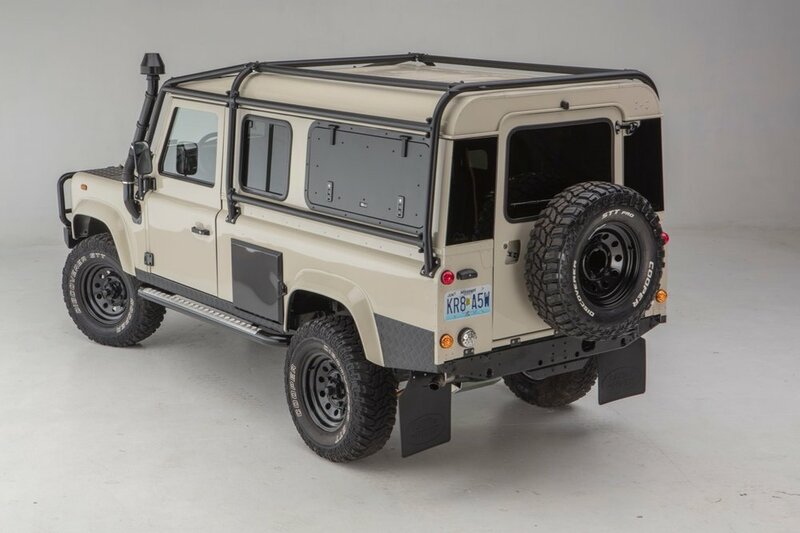 If you're planning a journey to Patagonia or looking for an (extreme) surf wagon for your next beach trip, this Defender is more than capable. Overview: Complete body-off restoration with left-hand drive conversion and extensive engine and off-road performance upgrades. Engine: The 200 Tdi is widely recognized as one of Land Rover's most successful engine designs. Known for reliability, it remains a very popular engine among Defender enthusiasts. To further improve performance and reliability, we rebuilt and upgraded the engine including an uprated intercooler and radiator from Allisport. We have also added a variable turbo to improve responsiveness. The result is at least 30% increase in torque and horsepower for cruising and off-road performance. Allisport aluminum expansion tank. Original plastic tanks have a habit of splitting because of the pressure from the cooling system. The Allisport upgrade is much stronger and more reliable. Allisport aluminum power steering reservoir. Original power steering reservoir often cracks after a number of years due to the vibration; this version is again much stronger and more reliable. New Ashcroft Engineering R380 gear box. The R380 was introduced with the later 300 Tdi and Td5 models of the Defender and is much stronger and more reliable than the original LT77 gearbox. Ours also has a higher 5th gear to improve highway cruising. Ashcroft are known throughout the Defender world as being the best in the business for anything transmission or axle related. Stainless steel door hinge bolts. The Defender’s body is made of aluminum and impervious to rust -- the original bolts are not. Replacing the original steel bolts for stainless improves longevity. New, updated dashboard. We updated the original with a new dash setup and center console developed for the 2005 model Td5. We feel this maintains an original look but improves functionality and ergonomics. New, updated gauges. We have also upgraded the gauges to the later digital gauges from the Td5. New Sparco R100 rally-style seats. Improved off road comfort without compromising on road comfort. Lassalle headliner with insulation to cut down on heat through the roof as well as wind noise. Exmoor Trim molded matting system. Exmoor trim are world renowned for their interior products for the Defender. This matting system cuts down on noise and heat from the engine and provides a finished look to the interior. Bulkhead reduction. We have shortened the bulkhead behind the front seats to allow the seats to recline fully. Adds leg room and comfort to the cabin. Heavy rubber matting in rear tub. Reduces road noise and protects the load bay. Updated wiring system. Replaces the original, fault-prone wiring system with an updated wiring loom; improves reliability as well as integrating the dashboard and gauge upgrades. Terrafirma heavy duty springs and shock absorbers allow the Defender to be loaded to full capacity and still maintain off road ability. Extra fuel tank. Boosts range to 600 miles. Mantec chassis mounted spare wheel carrier. A proven chassis mounted design that will withstand the harshest roads and allows easy access to your spare. Hood mounted spare wheel carrier. A trademark Defender look and essential for those trips when one spare just won’t cut it. Front and rear way bars. Essential for on-road stability with a heavily-laden vehicle. Safety Devices full external roll cage. No compromise on interior space. The roll cage bolts to 6 points on the chassis and is one of the strongest designs. Side storage lockers. Originally designed for the military, these lockers are made to fit two jerry cans of fuel. We like using them to store tools but they provide easily accessible storage space for anything. Front Runner gullwing side hatches. Easy access to the load bay. There’s nothing worse than stopping for lunch only to find that your cool box has been packed too far forward and you’ll have to unload to get to it. With these windows you can easily reach in and grab what you need. Aluminum checker protection plates. Added protection to body panels and door sills. Polyurethane suspension bushings. We like polyurethane bushings because you don't need a 20 ton press to remove them for field repairs.